Quick-dry minimal expanding sealant is an interior/exterior insulating product that stops household air infiltration by expanding to fill cracks where standard insulation is ineffective. All season formula cures from 30 deg. F. to 120 deg. F. Sealant dries fast, forming an airtight weather-resistant bond that seals out drafts and blocks insect and pest intrusion. Foam can be dispensed at any angle; however, upside-down dispensing is the most efficient means of delivery. Fill gap no more than 1/3 full allowing room for expansion. Foam is tack-free in 30 minutes. 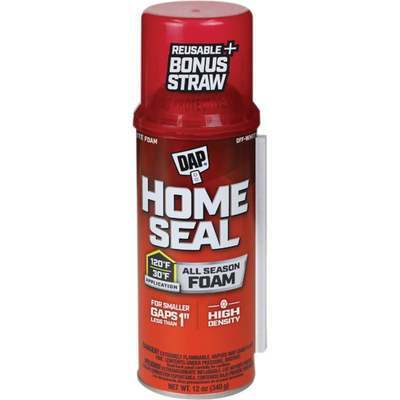 Excess foam can be trimmed, sanded, caulked, or plastered in 1 hour. Dispense by connecting straw to adapter. Can may be restarted for up to 3 weeks. UL classified. 12 oz.